A crucial part of contact lens hygiene is taking the lenses out before going to sleep. Read on as the team at Berks Eye Physicians and Surgeons explains why sleeping in contact lenses is a very bad idea. It can be very tempting to fall asleep without taking out your contacts. 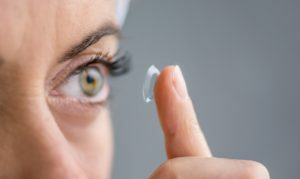 A survey by the U.S. Centers for Disease Control found that one in three contact lens users admitted to sleeping in lenses. But “daily wear” contact lenses must be removed to allow the cornea to get enough oxygen and to avoid drying out the lenses themselves. If contact lenses are not removed for sleeping, complications like corneal scratches and ulcers can occur. Sometimes contacts can fold up and get trapped underneath the eyelid. According to the American Academy of Ophthalmology, sleeping in contact lenses increases the risk of eye infection six- to eightfold. While some of these infections can be treated easily with antibiotic eye drops, others are very severe and can lead to corneal scarring that potentially damages vision. The most serious infections cause scarring so severe that it may require corneal transplant or lead to complete vision loss. The FDA has approved certain contact lenses as “extended wear” lenses that can be worn overnight, as the material allows them to “breathe” better than daily wear lenses. But you might not be able to tolerate overnight wear, even with extended wear lenses. Your optometrist or ophthalmologist can recommend whether you should wear extended wear contacts overnight and how best to avoid problems. Why risk the chance of developing a sight-stealing infection from sleeping in your contacts? For the sake of your ocular health and your precious vision, practice good contact lens hygiene. Take your contact lenses out before falling asleep and clean them carefully before putting them back into your eyes. See your eye doctor regularly to ensure your lenses fit and function optimally. If you are tired of wearing contact lenses and glasses to see correctly, you might be interested in LASIK laser vision correction with our team to reduce or eliminate dependence on visual aids. To discuss your LASIK options in detail with our eye doctors, please schedule an appointment by contacting our Reading, PA office today.